Monday, April 6 1908 -- The Pacific Coast League season has begun, and San Francisco is off to a roaring 3-game undefeated start. Oakland and Los Angeles, however, are having a mixed start due to yesterday's game. After Oakland squeaked by L.A. in the tenth, both teams now have a 1-1 record. In weazel-skin hat news, Hen Berry now has the mysterious 13th guest right in his hands, but doesn't realize it. Adam Chase (c) renewed 2013 by Russ Morgan. All rights reserved. Adam Chase strip #14, originally published September 4 1966. For background on the strip and creator, refer to this post. 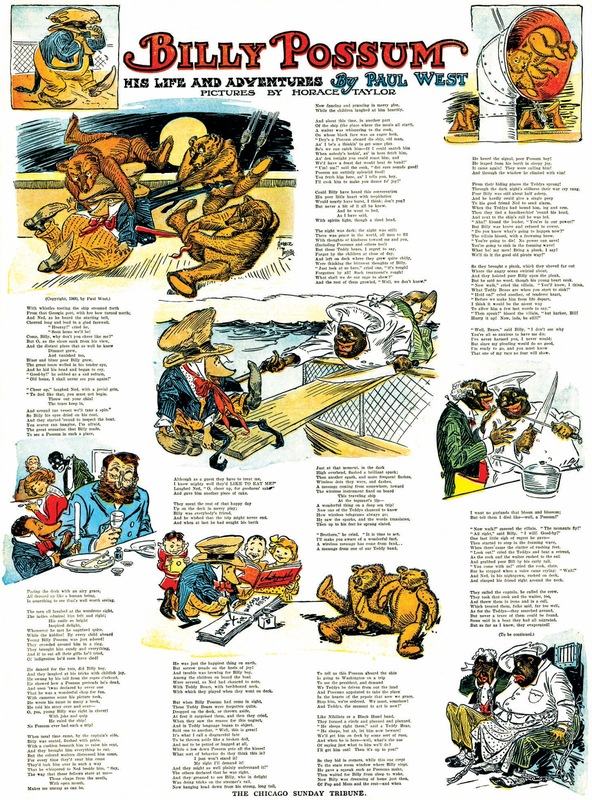 Although the Billy Possum series is awfully heavy on typeset text, I figure that the interesting subject matter and background story, and the two cartoonist creators, tip the scales far enough to make it Stripper's Guide material. If it weren't for Cole Johnson and Alfredo Castelli, though, I wouldn't even know about it. In the microfilm of the Chicago Tribune that I indexed, this series was missing entirely. Obviously some villain with a razor had gotten to the bound volumes before the microfilmers. Luckily, though, the researcher community comes to the rescue once more. From Castelli's Here We Are Again I learn that the series ran from May 9 to July 11 1909. The dates are significant, because this is no unassuming little funny animal series. No, the creators, Paul West and Horace Taylor, were doing a little bit of backhanded politicking in this series, not to mention putting in a bid to create a new national toy craze. We all know about the Teddy Bear and the cuddly toy's relationship to President Theodore Roosevelt. However, what is less well-known is that Roosevelt's successor, William Howard Taft, was marketed to the public with his own furry, cuddly toy equivalent, the Billy Possum. There is conflicting information about how and exactly when Taft was first associated with a possum. One story has it that the possum was picked because of Taft's penchant for falling asleep at innopportune times -- the possum being known as a good snoozer. Another story is that during the Presidential campaign Taft was served cooked possum at some southern function, and was so loud in his praise for the cooked critters that the connection stuck. In reality, my bet is that Billy Possum began its life more prosaically, purely as a marketing gimmick cooked up by back-room political operatives. Taft did not have the magnetic personality of Roosevelt, and his backers needed to try everything they could pull out of their bag of tricks to make the public like him. Pulled along on the coattails of Roosevelt's popularity, Taft was elected to office. Many of the votes cast for him were really for Roosevelt, who had let it be known with a wink and a nod that Taft was his man, would do his bidding, and it would almost be like having Roosevelt himself in the White House for four more years. Although popular with the common folk, Democrat and Republican alike, the Republican establishment was far less enamored of Roosevelt, and when it turned out after the election that Taft and the rest of the party had no intention of being Teddy's puppet, traditional Republicans were relieved. The Chicago Tribune was stolidly Republican, and undoubtedly was a less than enthusiastic supporter of the Roosevelt administration. When Taft was elected, the Tribune editors and ownership must have heaved a sigh of relief. The rift between Roosevelt and Taft is where the Billy Possum series originates. After the election, Teddy was surprised and definitely not dee-lighted to find that Taft had somehow grown a backbone. Roosevelt's ideas were falling on deaf ears in the White House, and he was not pleased. While the Taft-Roosevelt rift may not have risen to the level of open battle, it was a simmering feud that lasted throughout Taft's presidency. Seeing a chance to appeal to Republican papers, Paul West concocted a story wherein the virtuous, sunny and talented Billy Possum, through no fault of his own, becomes embroiled in a feud with all the Teddy Bears. The Teddies are unhappy that Billy Possum could become the next favorite doll, unseating them from their place at the pinnacle of toy success, where the love of all the children showers upon them. The Teddy bears are quite monstrously evil characters, and thus, through any underhanded nasty method they can come up with, they plot to kill poor Billy Possum. Of course in the end Billy Possum is going to win the battle, and in the second sample above, gets a personal endorsement from none other than Taft himself, who admonishes the possum to "fight to a finish" with the teddy bears. West and Taylor's Billy Possum may have been intriguing political satire, but it failed in its real mission, to ignite the interest of the nation's children and create a toy craze. The pages were far too wordy, and the action too violent. Although Billy Possum dolls were test-marketed, and other various doodads produced, nothing came of it. The series and the concept sank from sight with hardly a trace ... even on the microfilm. Billy Possum was concocted after the 1908 campaign, when in January, 1909 requesting, and wholeheartedly enjoying a plate of Possum at a dinner given by the Atlanta chamber of Commerce. This inspired some Atlantians to form the Georgia Billy Possum company, by Andrew and Susan Algood, and Mr and Mrs.Jack Minor of that city. 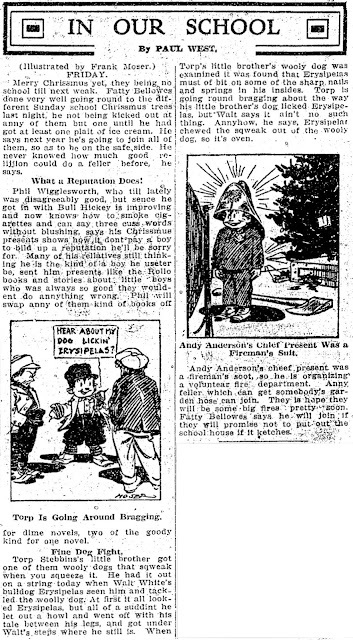 They dreamt up the character (with some inspiration, according to a news article, from an Atlanta Constitution editorial cartoon by staff man Gregg)expressly for licencing, and applied for a patent on 17 January. Things moved fast and soon, along with a whirlwind of promotion, Toys were on sale in New York department stores before the month was up.The dolls debuted, for instance, in Loeser's in Brooklyn. (A picture looks like they've taken the basic Teddy Bear body and modified the head and tail). They also offered BP belts and handbags. Soon there would be BP hats, cake, jewelrey and a song. By February 26, The firm was suing it's manufacturer, the Columbia Toy Company, as they were infringing on the patent by selling their own unlicenced versions. 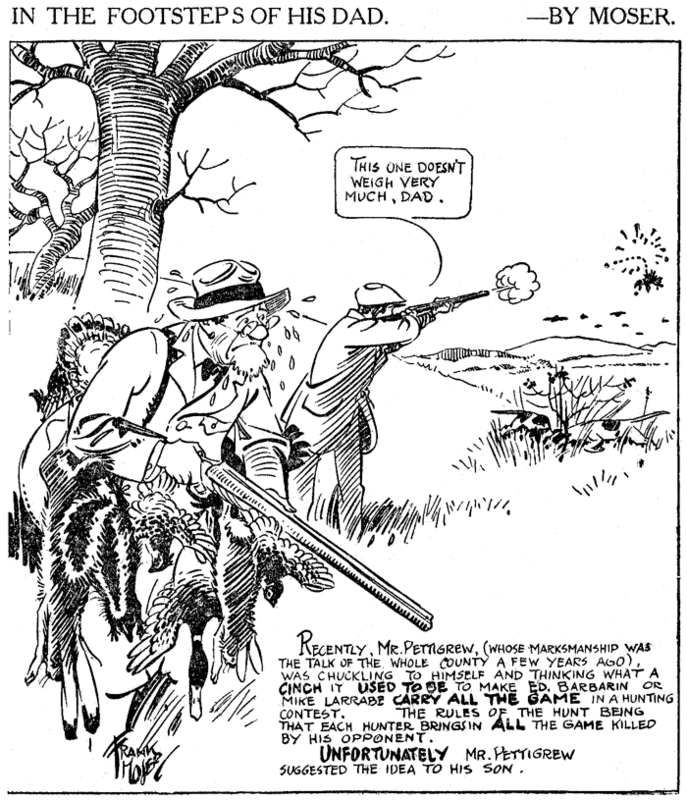 Apparently "Billy Possum" might have originally been a generic term, like "polly Parrot" because Joel Chandler Harris and Thornton Burgess used the name for possums in their animal stories. But in the end, despite many predictions of the demise of the Teddy Bear and the new permanant place in the toy world of Billy, he fizzled very quickly. That should say that it was President-elect Taft that enjoyed the Possum dinner in Atlanta. 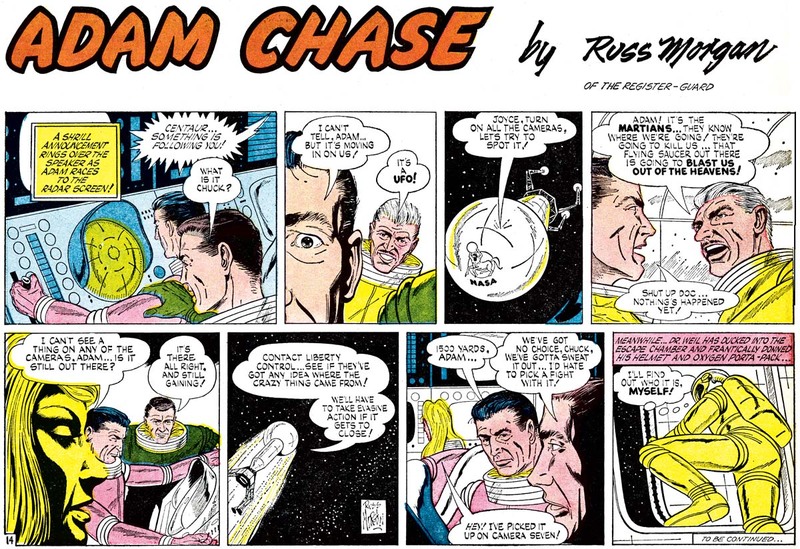 There's also an article in the May 9 Chicago Tribune that points to this new comic, as well as the recent additions of Danny Dreamer, Old Opie Dillock, and the addition of boys and girls pages in the paper, as being done in part as a reaction to the anti-comics crusaders of the time, trying to give "uplift" the comics with more sophisticated language, illustration, etc. 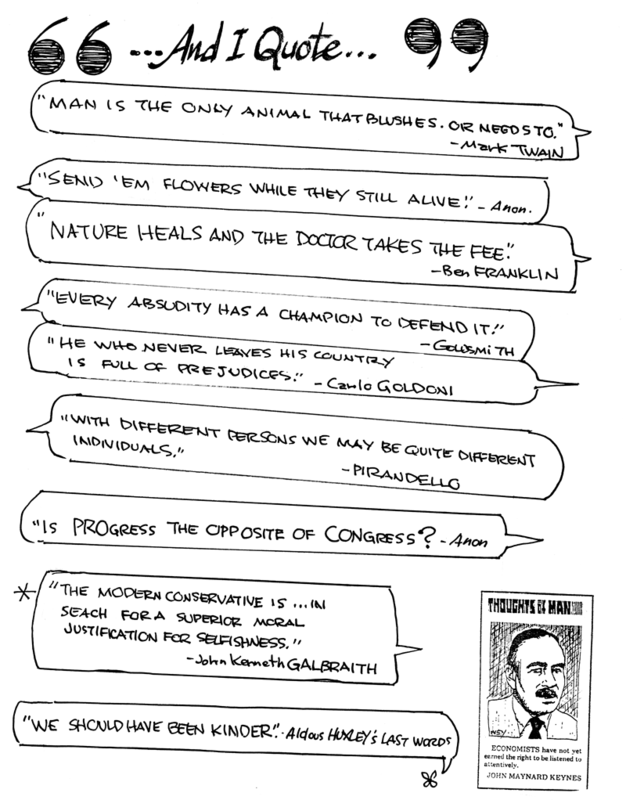 Cole Johnson sent me these panel cartoons awhile ago. They are all by Frank Moser and dated in March 1924. He asked me if I had any information about this apparently ongoing feature. I checked my book, and found Moser represented only by a short-lived 1914 feature called Summer Kids. In my files for Moser, however, I found a single panel that had the same sort of look as these, but dated in 1928, four years later than these samples. I knew then that Cole hadn't just found some weird little try-out thing that lasted only a month. But why no other information? Dave Strickler's E&P listings don't mention Moser, the other standard reference books either don't mention Moser at all or focus only on his animation career, Alex Jay's research for yesterday's Ink-Slinger Profile revealed nothing about it, and both Cole's samples and mine don't even have syndicate stamps, so we haven't even a loose thread on which to start pulling. I took a shot with Newspaperarchive.com, which I gave up on pretty quickly as it has gotten unbelievably slow and annoying since their latest redesign. My searches for "by moser" turned up lots of bad results but I found none that actually pointed to these panel cartoons. Finally I decided to go through my old, badly faded photocopies of the E&P syndicate books. I know Strickler's E&P book did not catch everything from those early listings, because E&P did such haphazard categorization. Perhaps I could find some feature that mentions Moser as the creator. Ah ha! That explained a lot! First, the lack of a syndicate stamp is typical for Associated, so that ends that mystery. Second, the multiple creators and lack of a series name explains all the rest. Strickler wouldn't have included such an oddball, vague listing in his book, and it also explains why we never seem to find a real run of these Moser panels. It's because this was an early sort of multi-creator series that we wouldn't really see again until the advent of features like Laff-a-Day, This Funny World, and others in the 1930s and 40s. Moser might have appeared once a week or even less. And many newspapers using this series, since it wasn't even really identifiable as a series, would probably not have run it consistently anyway. So my 1928 sample is either old material, or Associated Newspapers wasn't even bothering to tell E&P about this oddball feature anymore. The only missing piece is to find a newspaper that did actually run this 'feature' consistently. As it is, I really don't feel I have enough solid information to add a listing for it to my book. How many others contributed to the series? 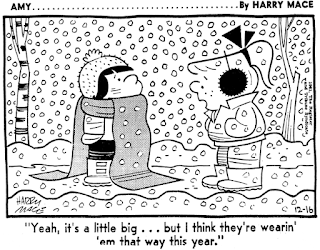 When did the various cartoonists start and end their association with the feature? Did they contribute consistently, or is the feature a true grab-bag of creators? Was the feature still running in 1928 and possibly beyond? How long before 1924 might it have been running? Allen- I have a cache of originals for these. Recurring titles included FAMILY WASH. Engraving notes indicate a daily feature. Email me for more info. 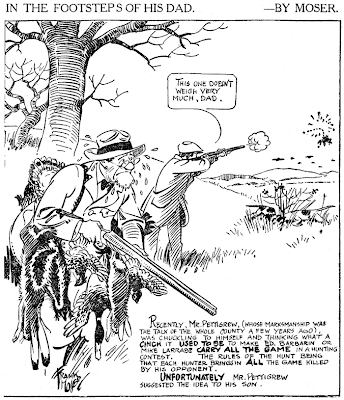 The earliest one of these panels I can find is 17 July 1922 in the Boston EVENING Globe for one of the Moser strips, the latest in the Souix City Journal 24 November 1925. The earliest of the John C. Terrys I can locate is the in the Boston EVENING Globe for 15 December 1922 for his "MISTAKE OF A LIFETIME" and the latest would be in the Sioux City Journal on 10 March 1926. 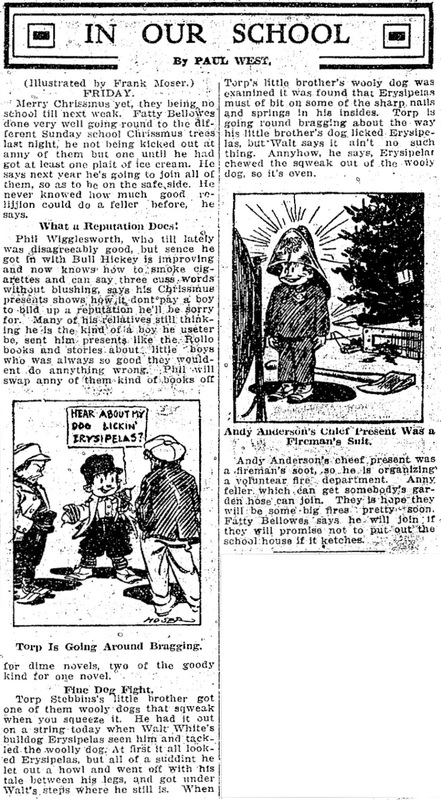 In the San Antonio Light of Sunday 17 December 1922 is the earliest of his WHAT CAN YOU DO WITH A GUY LIKE THAT?" 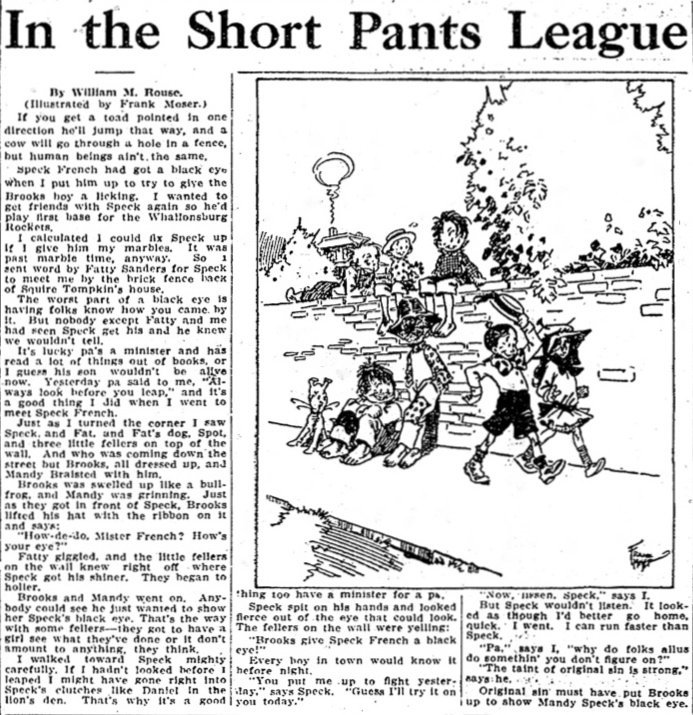 the latest would be in the Sioux City Journal on 24 November 1925. I couldn't find anything with the FAMILY WASH title, though. Thanks VERY MUCH for all this info! Not sure where or if I can view these online (as I said in my post, Newspaperarchive runs like syrup running uphill in January for me right now). Did you find that any of these papers was printing the feature on a consistent daily basis, including all the creators? What I'd really like to do, when the web-gods permit, is to review long swaths of the series to see which cartoonists are used (that etc in the listings is quite intriguing) and see if I can create a reasonably good Stripper's Guide listing for this rather thin series. Without a consistent creator or title, they certainly are stretching the boundaries. Frank Herman Moser was born in Oketo, Kansas, on May 27, 1886. His birthplace was identified in the New York Times, October 2, 1964, and his World War I draft card had his full name and birth date. In the 1895 Kansas State Census, his German-born mother, Alviena, was the head of the household. Of the seven children, he and his twin sister, Martha, were the youngest. They lived in Marysville, Kansas. The National Cyclopaedia of American Biography (1970) said his father’s name was John Jacob, a farmer. 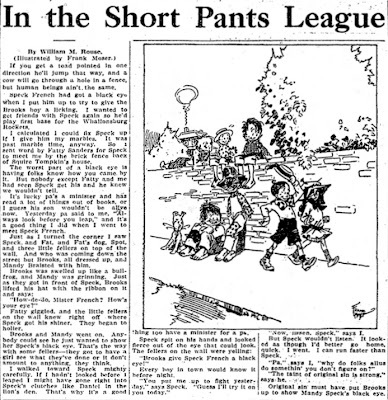 A profile of Paul Terry appeared in the Yonkers Statesman (New York), June 20, 1931, and about Moser it said: “…Moser, was illustrating the Sunday supplement of the New York Press….Among the strips created by the quiet, pleasant Moser was a Sunday series known as Fan Fanny in Sport, a cartoonization of a man, his wife and their dog….” [Allan's note: I did not find any comic strip series by Moser in my indexing of the New York Press newspaper]. 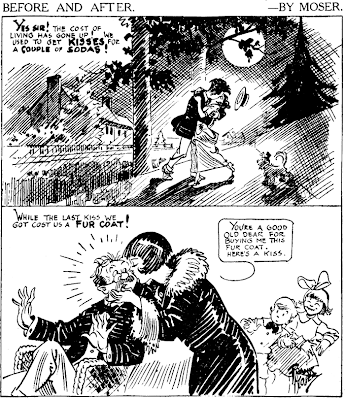 According to American Newspaper Comics (2012), he produced the panel, Summer Kids, which was distributed by Associated Newspapers in 1914. 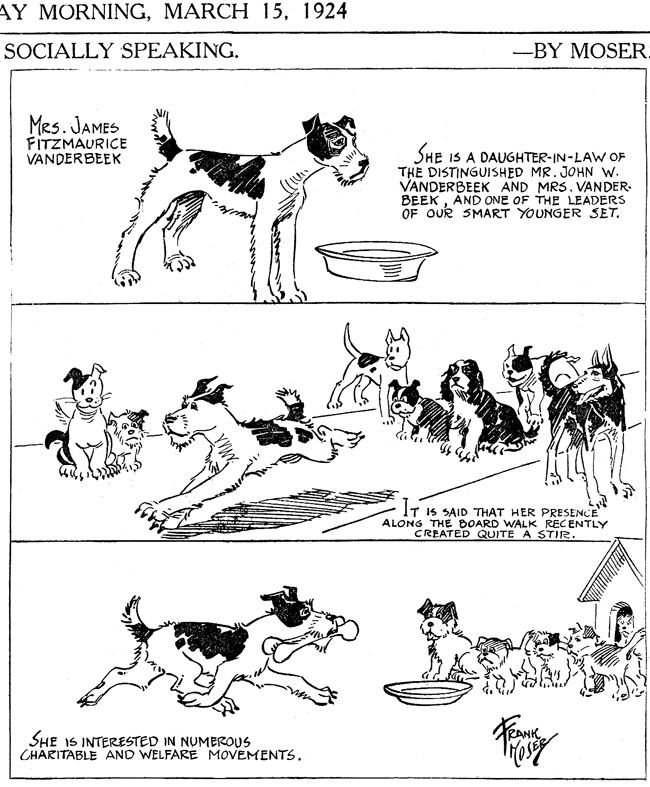 …In 1915 he had done a series of animation subjects for the Edison Company in New York, and a year later he had founded the animation department for the International News Service in the same city, animating the first “Krazy Kat,” “Bringing Up Father,” “Jerry on the Job,” “Happy Hooligan” and “Little Jimmy,” all then current comic strip favorites in the Hearst newspapers. He was with [John] Bray during the Paramount period. 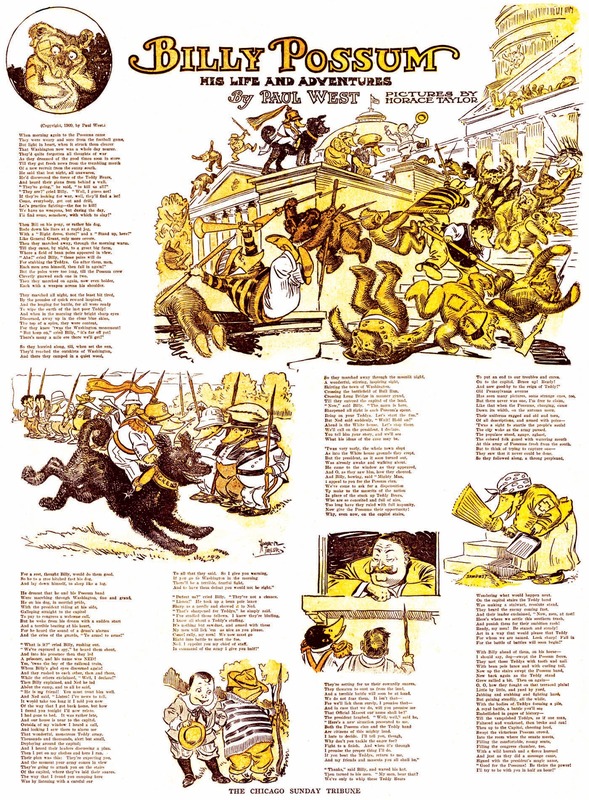 When he joined Terry in 1919 it was to make “Aesop’s Fables” until those amusing drolleries had reached the astounding number of 430 separate releases…. 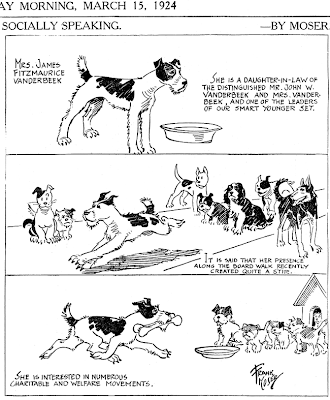 …One of the most unique numbers is Frank H. Moser, in Animated Cartoons—The Secret Exposed. Mr. Moser is the creator of the well-known animated cartoon, “Bud and Susie,” who, by the way, are better known in River View Manor by their right names, John and Marjorie Moser. Mr. Moser will appear in person and demonstrate how it is made, drawing the pictures right on the stage. This has never before been shown. According to the Register, September 21, 1928, Moser was treasurer of the Hudson River Valley Art Association; he and his wife accepted the invitation to become charter members in the association. In 1929, he and Paul Terry co-founded a company to produce animated cartoons. A photo of the Terrytoons staff is here. The July 26, 1929, Register noted a visit by his twin sister, Martha, who was a school teacher in San Francisco. Six weeks later, his daughter passed away at home; the cause was tubercular meningitis, as reported in the Hastings News, September 6. Three months later, tragedy struck again, when Moser came home and found his wife dead, a suicide of gas poisoning. The Register, December 13, 1929, said she was despondent over the death of her daughter, who would have been fifteen on the ninth. White Plains, Dec. 1.—Frank H. Moser of 37 Hollywood Avenue, Hastings, well known animated cartoon artist, charged in affidavits today that his former bosom friend and fellow cartoonist, Paul H. Terry of Larchmont, persuaded him by fraud and deceit to sell for $24,200 his 50–50 share in their highly profitable Terrytoons, Inc., then feted him at a testimonial dinner marking severance of their business relationship last March 2. Terrytoons, Inc., has its studio at the Pershing Square building in New Rochelle. Moser, who is forty, is suing in Supreme Court to regain his half share in the corporation or, in the alternative, for $500,000 damages. He names as defendants Terry, whose home is at 115 Beach Avenue, Larchmont; William M. Weiss, who was their secretary-treasurer; Terrytoons, Inc.; The Moser and Terry Corporation, which was succeeded by Terrytoons, Inc., and Earl W. Hammons, president of Educational Films Corporation of America, distributors of the Terry and Moser animated cartoons. New York, May 5 (AP)—Manfred Hauptmann, five-year-old son of Bruno Richard Hauptmann, was treated today for a double leg fracture suffered when he was struck by an automobile. The boy, playing on a Bronx street yesterday, darted into the path of a car driven by Frank H. Moser, of Hastings-on-Hudson. His right leg was fractured above and below the knee, Fordham hospital physicians said, and his cheek and ear were cut. His mother, Mrs. Anna Hauptmann, widow of the man executed for the slaying of the Lindbergh baby, now uses her maiden name—Schoeffler. New York, Feb. 2 (AP)—The six-year-old son of Bruno Richard Hauptmann, executed kidnapper of the Lindbergh baby, has been awarded $23,500 damages against Frank Moser, a cartoonist, for allegedly permanent leg injuries suffered when he was struck by Moser’s car. The child, Manfred Hauptmann, was hurt while playing in front of his Bronx home May 5, 1938. His mother, who sued for $100,000, was awarded $2,000 by a jury yesterday. Moser’s attorney called the award excessive and asked that it be set aside. Justice William F. Love reserved decision. Mrs. Hauptmann, whose husband was electrocuted in 1936, charged Moser with negligence. The cartoonist’s counsel said the accident was unavoidable. The verdict was returned in the Bronx county courthouse where Hauptmann first was arraigned on charge of kidnapping the infant son of Col. Charles A. Lindbergh. In the 1940 census, Moser and his family remained at the same address. He was an animation cartoonist in the movie industry, and his highest level of education was four years of high school. A filmography is here. He continued painting and exhibited in galleries in New York and Westchester County. He was a member of the Allied Artists of America, the American Watercolor Society and the Salmagundi Club. 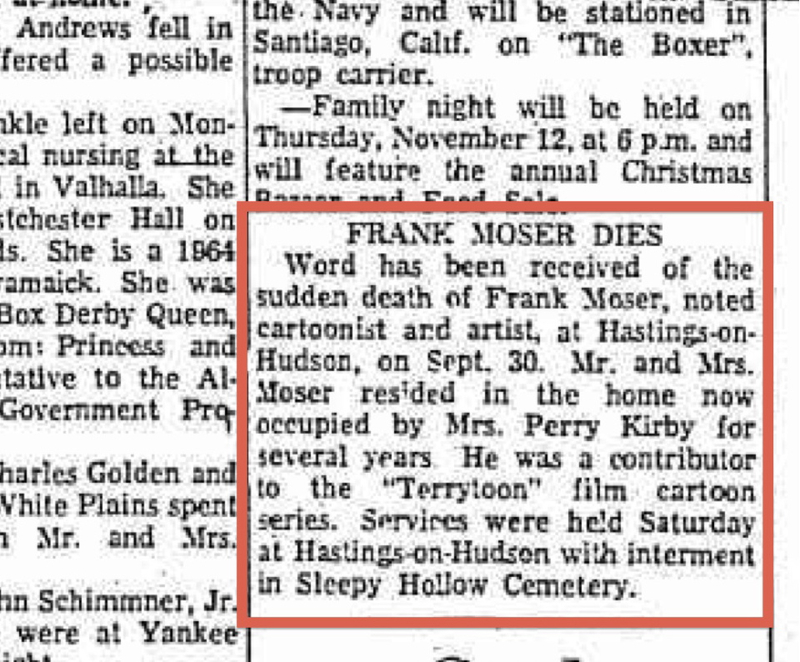 His twin sister passed away September 29, 1958, according to the California Death Index. Dobbs Ferry, N.Y., Oct. 1—Frank H. Moser, an artist who was co-founder and producer of Terrytoons, the animated cartoon films, died yesterday in Dobbs Ferry Hospital at the age of 78. He lived at 37 Hollywood Drive, Hastings-on-Hudson. Word has been received of the sudden death of Frank Moser, noted cartoonist and artist, at Hastings-on-Hudson, on Sept. 30. Mr. and Mrs. Moser resided in the home now occupied by Mrs. Perry Kirby for several years. He was a contributor to the “Terrytoons” film cartoon series. Services were held Saturday at Hastings-on-Hudson with interment in Sleepy Hollow Cemetery. And the National Cyclopaedia of American Biography had the same date. Hello, Allan----For many years, Paul Terry had promised his cartoon directors that as a reward for their loyalty, they would eventually all retire together, and the profits from selling TERRYTOONS would be shared between them. In the 1950's, Terry secretly sold the company and his film library to CBS for a million dollars. The old crew didn't find out until Terry was leaving the place for the last time. His hurt (and gullible) team asked him what was going on. "None of your business", Terry arrogantly said, and never saw them again. My sympathies go to Mr. Moser, whom shlockmeister Terry gave the fast shake all those years earlier. Allen--Moser's Fan, Fanny and Sport series appeared in the Des Moines Register and Leader in 1911-1912 and consisted of ten cartoons published intermittently in the sports section chronicling the local baseball situation. Thanks for that! Might you have any samples to share, or be able to provide the specific start and end dates of the series? 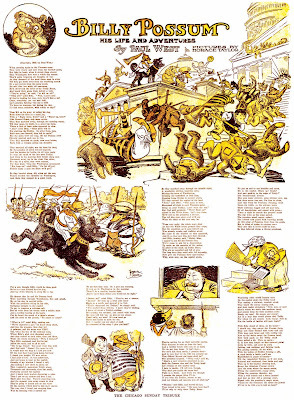 Harry Mace, who was a prolific magazine gag cartoonist in the 1950s, began to make a concerted switch to newspaper work as the magazine markets started to dry up. 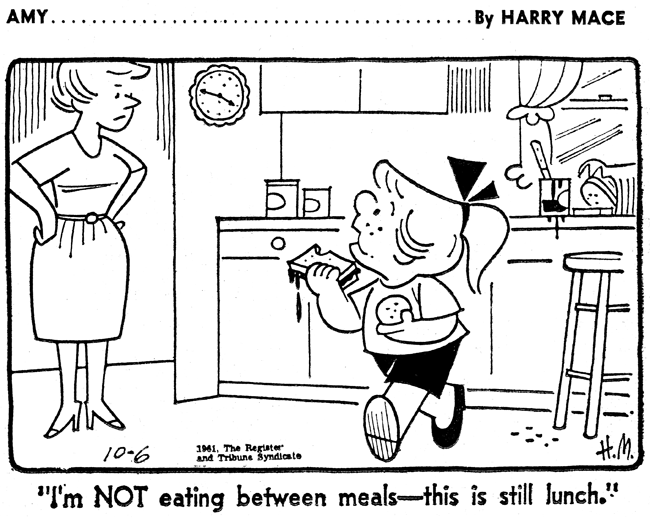 He hooked up with the Register & Tribune Syndicate in 1957, and did a kid panel titled Junior Grade for them. It didn't really seem to be going anywhere fast, and was dumped in 1960. 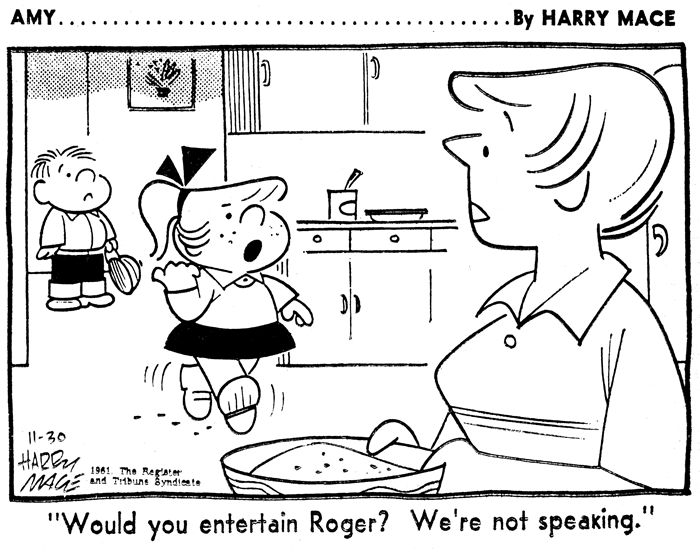 However, Mace and R&T seemed to be set on the idea of making a kid panel work, and on September 25 1961, Mace was back with Amy, a daily gag panel about a sassy tomboy. Amy's personality was a mix of Dennis the Menace and Lucy from Peanuts -- comparisons that probably didn't hurt a bit in the feature's marketing. The feature suffered from an overabundance of weak gags in my opinion, but the crisp artwork and aura of other successful comic characters seems to have turned on enough newspaper editors to call itself at least a modest success. The panel debuted with a client list of a little under fifty papers. Unfortunately for Mace, he was not going to bask in his success for long. After a brief illness of some kind, Mace died at the age of 41 in December 1963. That could have easily been the end of Amy, which was not setting the world on fire, except that Mace's close friend and neighbor, fellow gag cartoonist Jack Tippit, had been assisting on the feature. At first Tippit had supplied occasional gags, but when Mace got sick Tippit took over the entire production. Register & Tribune was so impressed with the perfect match between Mace's style and Tippit's that they saw no reason to drop the feature, and Jack Tippit's byline started appearing on the strip on January 27 1964. Tippit, obviously seeing the same writing on the wall regarding the decline of the magazine gag market, readily accepted the assignment and continued Amy. He shepherded the feature to a thirty year run, never in a lot of papers, but enough to make the feature worth producing, ending sometime in 1991. By then the feature had outlasted it's own syndicate, and had been taken over by King Features for the final half-decade of its run. Despite its long run, Amy was only once collected in book form, an Ace/Grosset & Dunlap paperback issued in 1978. The Register & Tribune syndicate was absorbed by the Hearst corporation in 1986, the biggest prize being The Family Circus. The former R&T titles were now under the banner of "Cowles Syndicate Inc." though King Features was the syndicator. The final AMY was 6/6/92. Thanks very much for that definitive AMY end date, Mark! Re Cowles Syndicate, are you saying that R&T did that name change to signal that they were now having King handle the distribution? My understanding is that King bought Cowles for $4.2 million in 1986, a year after R&T changed names. This is the sort of syndicate business minutiae that I just dote on! In your book you have another Mace strip called Junior Grade, which predated Amy. I have a few on my blogand it isn't to bad. I also have a sries of names cartoons that I couldn't place for a Salt Lake City paper. It has the King Features logo and seems like it's part of a serie with several artists, except that on the days Mace doesn't appear there is no ther cartoon. Could it have been something like Bud Blake's series? In this case the titles are new every day, though. YOu can find it on my blog under the Harry Mace label. The register & Tribune was owned by the Cowles family, which at one time also published LOOK. The change to the Cowles imprint from the Register & Tribune one took place long before the Hearst corporation bought the syndicate, in early 1985. 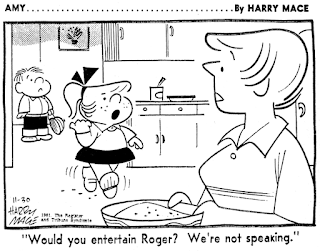 The first "Family Circus" with the imprint of Cowles Syndicate Inc." was 25 February 1985. I was aware of the R&T - Cowles name change in 1985, prior to the sale to King. What I thought you were indicating in your first ms. was that the name changed signaled that R&T's features were now being distributed by King (sort of like George Matthew Adams' Sundays way back when). I gather I misunderstood you. 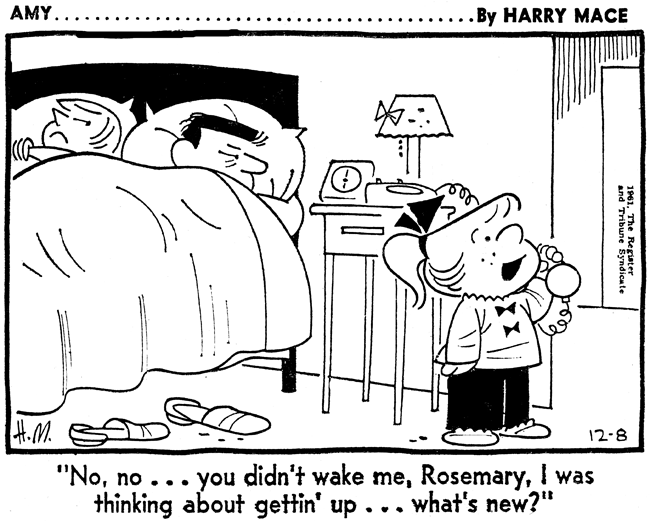 Ger -- those Harry Mace cartoons look to be in the standard Laff-a-Day format, but I wasn't aware that King ever provided daily titles and credit slugs for them. So it sure looks like it could be a Harry Mace-only gag feature. Or, the editor of that paper REALLY REALLY loved Harry Mace's work, picked out the Laff-a-Days by Harry, and added a credit. Which seems pretty far-fetched. 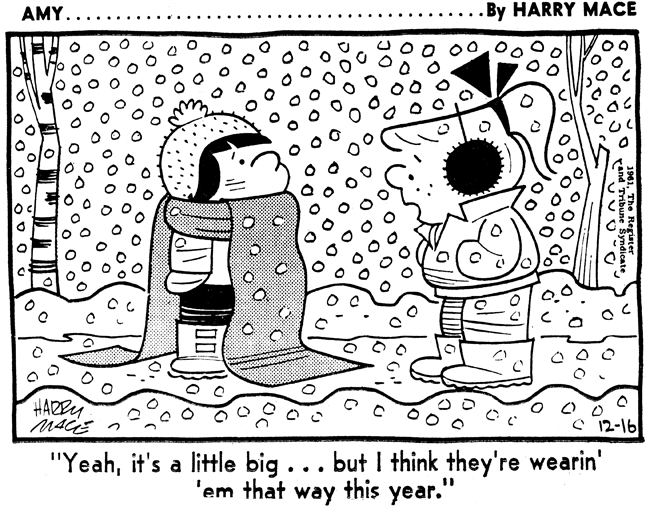 Harry Mace was a friend of my parents when I was growing up in Redding, CT in the 1950s. He gave them a signed panel which shows a couple at the front door returning from an evening out, and the babysitter standing in the midst of the bombed-out living room is saying "I've decided something tonight, Mrs. Prindle...I don't think I'll ever get married." I remember that Harry's wife was named Peggy, and they had a daughter Janet. Harry Mace was my father. You might be interested to know that the original name for the panel was 'Phoebe' but the syndicate rep didn't like it. He said it remiinded him of a former girlfriend, so my dad changed it. I'll be sending you an email shortly to clear up some of the mysteries that I've just learned are floating around and to offer you some clean clip sheets of both Amy and Junior Grade. Not being sure how often you check back for new postings, email seems safer for that. Thank you for the info, Janet! Looking forward to any additional info you care to share. The Art Wood Collection in the Library of Congress has 12 Mace original drawings. 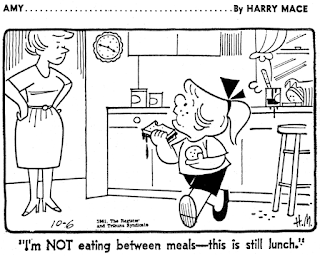 The last one is dated March 17, 1961.